Beautiful, strong, and wild, America’s wolves once ranged across most of the United States. More than a symbol of wilderness, scientists agree that wolves have kept nature in balance and have helped maintain healthy populations of other important species. But, centuries of hunting, trapping, poisoning, and a government-sponsored eradication campaign had essentially eliminated wolves from the American landscape. Today, thanks to the safety net of the Endangered Species Act, wolves are finally beginning to recover in wild places and are once again a vital part of America’s wilderness and natural heritage. Gray wolves returned on their own to the Western Great Lakes region and northwest Montana and were reintroduced to Yellowstone National Park and central Idaho. We have also returned gray wolves to a small area of the high desert Southwest, and red wolves to a portion of eastern North Carolina. However, the current restoration efforts by the U.S. Fish and Wildlife Service (FWS) endeavor only to recover small, geographically isolated populations encompassing a relatively insignificant portion of their historic range. 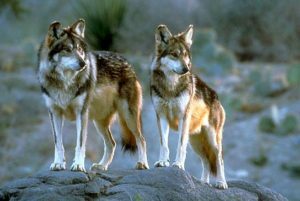 And although gray wolves are slowly making their way into places such as Oregon and Washington — and one wolf has made it to California — the FWS has no plans to restore wolves to substantial areas of suitable habitat that exist in places such as the Southern Rocky Mountains, New England and, in the case of the red wolf, the remainder of the Southeast. In fact, the current FWS proposal will strip protections of the Endangered Species Act for all gray wolves, except for the tiny population that is struggling to survive in the Southwest. If the current proposal is approved, it will allow states to engage in widespread shooting, trapping and poisoning of gray wolves. Any gray wolves attempting to repopulate additional portions of their former range could be heavily targeted for persecution. In the absence of legal protection, these wolves may never be able to establish sustainable populations across much of their suitable habitats. 1. 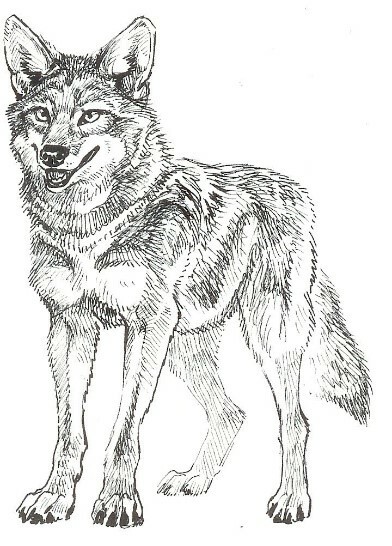 Restoration of wolves in suitable habitats across North America, from the Northern Sierra Madre Occidental in Mexico to the Canadian Rockies, and from the U.S. Pacific Northwest and California to the Upper Great Lakes, the Northeast, and the Southeast as well. 2. 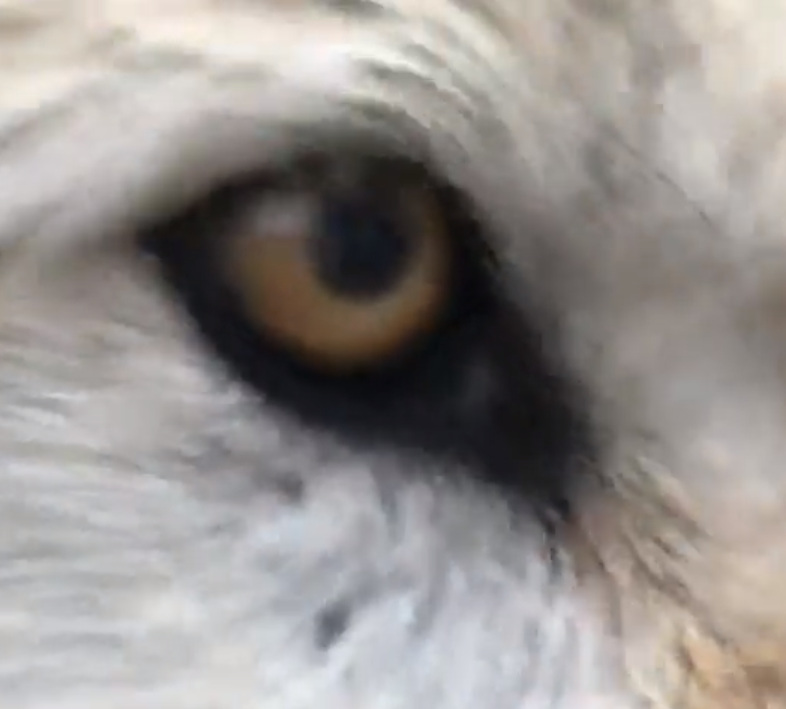 Protection and restoration of all suitable wolf habitats and the crucial corridors that link these habitats together, at the local, regional, and continental scales, allowing wolves to roam freely across a network of interconnected wild lands. 3. Restoration of wolves in ecologically and evolutionarily effective populations so that they may fulfill their natural keystone role of ecosystem regulation, aiding the continued diversity of native flora and fauna. 4. Increasing Social acceptance and appreciation by humans for the role that stable wolf populations play in reestablishing healthy landscapes across North America. Coyotes are family oriented and very intelligent. They are indeed wily. They possess intelligence, feelings and emotions. They experience pain and grief. They love and care for each other. Native Americans admired and revered them. Coyotes are much more beneficial than harmful. Coyotes control rodent and rabbit populations, thereby checking the spread of Lyme disease, Rocky Mountain spotted fever, and chronic wasting disease (which is lethal to deer, elk and moose). By reducing rabbit populations, they create more forage for deer, elk, mountain sheep, pronghorns and moose. Despite this, coyotes are killed by the thousands in Utah and other western states. Utah is one of only two states that has a bounty on coyotes: If you have a dead coyote in hand and can prove it was killed in Utah, you can get paid $50 by the government! There are also “coyote calling contests” in rural parts of the state, where a small entry fee allows you and a partner to engage in “calling” in and shooting as many coyotes as you can during a period of one or two days. The team that kills the most coyotes, or the largest one, wins a prize, which is typically a piece of hunting or trapping gear. Participants often describe the thrill and sheer fun they enjoy. 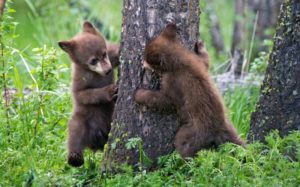 They think of it as a wholesome activity that actually benefits other wild animals, ranchers and farmers. Yet random killing of coyotes, as occurs with coyote kill contests, has been shown to not reduce livestock depredation or to increase deer and elk herds. Furthermore, it typically causes compensatory breeding by subordinate animals plus new coyotes migrating to fill the empty niche, resulting in even more coyotes, and hence more predation on deer fawns and sheep. In short, coyote killing has been scientifically shown not to accomplish any legitimate wildlife management or livestock husbandry objective. Despite their sentience and intelligence, their great beauty and ecological value – despite all these positive values, and despite the total lack of evidence that it does any good – coyotes have no legal protection in Utah and other western states. A license is not needed to kill them and there is no bag limit. Nor are there any special restrictions on how you can kill them: guns, fire, rat poisons and neck snares – all are legal. The only thing that is illegal, it would seem, is allowing coyotes to go about their lives unmolested. Given all these facts, can coyote kill contests possibly be moral? Is killing intelligent beings for fun a moral activity? What Good Are Large Carnivores? There are many good reasons to care about carnivores. The very term means ‘meat eater’ and they do kill and eat other animals, which can arouse fear and loathing in some people. Trout and praying mantises also kill and eat other animals, by the way. Praying mantises could just as well be named preying mantises. But when we are talking about biological classification, ‘carnivore’ is the term for an order (order, family, genus, species): it designates mammals with carnassial teeth. Carnassial teeth are the pairs of teeth on the sides of the jaw where molars appear in humans and deer. Rather than the top carnassials falling flat onto the bottom ones, they overlap the bottom ones like a pair of scissors – good for cutting meet, hide and sinew. Thus, bears, which are actually omnivores, are classified as carnivores because they have carnassial teeth. In reality, most bears eat mainly vegetation, such as grass and tubers and pine nuts. Coyotes too, unlike their cousin the wolf, eat a lot of vegetation and even garbage. That’s one reason they do so well living near, and even in, our cities. I heard coyotes yipping in the middle of the day while walking Luna dog in lower City Creek just yesterday. So did Luna, and it really caught her attention. Back to the question: Why protect and conserve wild carnivores? Here are some of the main reasons. Cougars and wolves are especially good at keeping ungulate herds healthy, as they tend to remove the least healthy animals. Wolves are in fact very much analogous to the white corpuscles of our own immune systems, in that they key in on sick and feeble animals and remove them from the population. This could be especially important when a disease such as the encroaching chronic wasting disease (CWD) begins to affect herds of deer and elk in the Rocky Mountains, as has already begun to happen. Cougars, too, have been shown to focus preferentially on deer that have CWD. Mesopredators, such as the coyote and the bobcat, do much to keep rodent populations under control. Cougars and wolves in particular also keep prey populations within the carrying capacity of the habitat. You may recall that Aldo Leopold warned Arizona game managers not to kill off all the cougars and wolves on the Kaibab Plateau, but they did so anyway, hoping it would result in more deer. And did it ever – with devastating consequences. In fact, this was the main scientific justification for reintroducing wolves to Yellowstone. The elk herd had grown way beyond carrying capacity and was wreaking havoc on the land and its wild denizens. Think of large wild carnivores as the evolutionary dance partners of wild ungulates. They shaped each other into what each now is through the long eons of evolution. They belong together. They need each other. Now we are beginning to “think like a mountain,” as Aldo Leopold put it in a famous essay by that title. Add to this the fact that cougars, bears, wolves, bobcats, coyotes, lynxes, fishers, otters, martens, foxes and wolverines are just plain beautiful animals. And the stories of their lives are fascinating. Large carnivores are always fewer in number than the species they prey upon. Thinks of the shape of the food pyramid. In all of Yellowstone National Park, at any given time there are only about 75 wolves and only about 25 cougars – all in an area that is roughly 3600 square miles. That’s one large carnivore for every 36 square miles – hardly too many. Adult animals need large home ranges. Thus, protecting and conserving large carnivores requires protecting and conserving large areas of habitat, which not only results in protection and conservation of the carnivores, but of all the other species of plant and animal that live there as well. For this reason, large carnivores are sometimes referred to as “umbrella species”. Large carnivores have been heavily persecuted since the first pioneers settled the West. Indeed, the wolf was entirely eradicated from the Western U.S. by about the mid-1930s. Only in the late 1960s were cougars finally removed from the list of vermin and given the status of a protected species in the Western states (which, outside of Florida, were the only ones that still had populations of cougars). 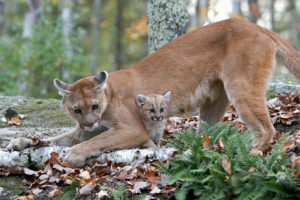 Now, with the sole exception of Texas, all states west of the Mississippi River that have cougar populations require a permit for hunting them. California has gone a step further and completely outlawed the hunting of cougars. If a cougar kills your goat, you have to get a special “depredation” permit to kill that specific cougar. Only 100 or so cougars are killed on depredation permits in California each year. Last year, Utah killed 400 cougars. 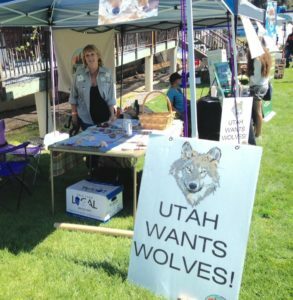 Western Wildlife Conservancy is a small organization, and the only one in the state of Utah whose mission is to resist the regressive forces of carnivore oppression and persecution that are very strong here – a state where the largest convention of the year is now the “Hunting Expo” which caters mainly to trophy hunters. We will keep on doing our best to educate folks on the importance of carnivore protection and conservation, and to advocate for these wonderful creatures. coyotes in a dubious effort to increase mule deer populations. so it is democratic, ecologically responsible, and humane.